The gospel is the story of Jesus and what he has done for us, not what we are supposedly obligated to do for God. One is grace; the other is impossible. This is too much for some people to handle. Grace – free and without end – scares them. They want lists so they know what grace won’t cover. They want limits so they know what’s on the other side of grace. They want rules so they know what’s expected of them. Grace doesn’t give them any of these things. Grace won’t beat anyone down for failing to follow a rule, check off a list, or stay within the lines. 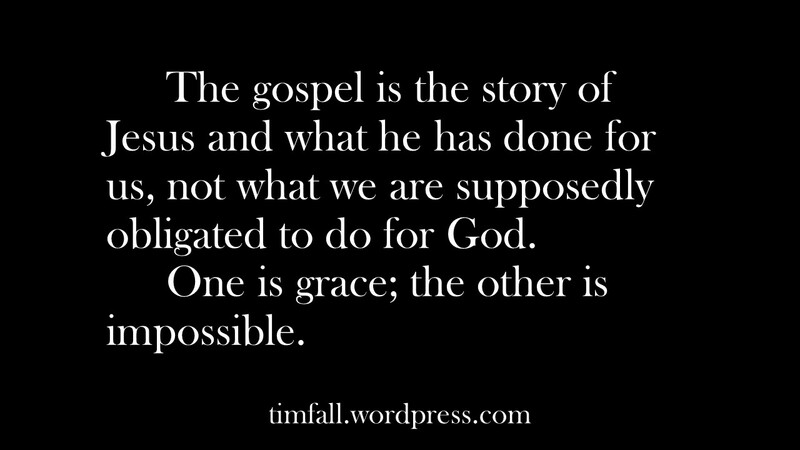 Rather, God’s grace does the opposite. It lifts you up. And your eternal standing of peace with God doesn’t depend on you one bit. It’s all God. God’s grace has brought you peace, and it has also set you free from rule-following. Can you handle God’s grace? Can you handle that it is a free gift that in turn sets you free from rules and lists and being burdened by expectations you never meet? Free means free. It’s not up to you to earn God’s grace and it’s not up to you to keep it. It’s all God, and it’s all yours. Grace, peace, faith – this is how much God loves you. Handle it, because he has you in his hands forever. This entry was posted in Uncategorized and tagged freedom in Christ, God's grace, Gospel. Bookmark the permalink. Thank you, Tim. The many messages you’ve written on grace since I’ve been following you have solidified my thinking about this. It is so easy to slide off of grace. It’s amazingly easy to slide off it, Jim. I’m glad his grace is sufficient to cover even those times I try to live without it. Grace is the single-most important concept in the Bible. It’s also one of the hardest things to understand and accept. We DO “slide off it”!! Only when we re-set our focus on Christ and His completeness can we keep ourselves on track.Thank you so much for this wonderful post! Yes, that’s it–“creating the environment for it.” I think maybe Bill Gothard did that one? (Among many.) Of course that’s nothing but works sanctification. One response, There is no end to God’s mercy and grace. Man does have a limit. Heaven and good awaits His children – but while we have our feet on planet Earth, He does allow some things to happen we may never understand. That verse is part of a broad discussion of our lives in Christ. This post is about the more focused point of what constitutes the gospel itself, the story of what Jesus has done to allow us to even have that life in him in the first place. Loved this simple and very scriptural reminder that’s it definitely (and thank goodness) not “all about us.” We do that a lot. And, I think many of our hand-wringing and arguments center around those self imposed rules. Thank you! I loved this. I am so glad that Jesus set us free from those self-imposed rules. Tim, I always enjoy your words on this subject. We need to be reminded that it really is all about what Jesus has done, not what we can do if we try hard enough. The person who lives the Christian life is Christ in me. And I am grateful for the Holy Spirit’s presence enabling me to live in Christ. I’ll be completely honest. I too, had (and continue to have) problems with accepting God’s grace. The church environments I was raised in almost never mentioned or preached the wonders of grace. It was about status, behavior, deeds and knowing your place. After so many years of hearing about how important my submissiveness as a woman and my unquestioning obedience to my parents as a child was, I thought that one small step out of line meant eternal hell and damnation for me. When I was young, I would lie awake a night, scared that the rapture would happen and that I would be left behind. I was convinced that God wanted nothing to do with me either because of my behavior or due to things that were beyond my control (for example, gender, social status etc.) Having only heard of grace recently, I still find myself reluctant to really accept that grace is a gift that comes with no strings attached and no previous requirements. Everyone step out of line, including those legalistic folks who told you not to step out of line. God’s grace covers you and me and them as well.